We like to think we are masters in our own house, but clearly we are not. We are renters at best. Psychologically we live in a boarding house of saints and knaves, nobles and villains, run by a landlord who for all we know is indifferent to the lot. We fancy we can do what we want, but when it comes to a showdown our will is hampered by fellow boarders with a mind of their own. In the jargon of Jungian psychology, these “fellow boarders” are known as complexes. Freud described dreams as the via regia to the unconscious; Jung showed that the royal road to the unconscious is rather the complex, the architect of both dreams and symptoms. In fact, Jung originally gave the name “complex psychology” to his school of thought, to distinguish it from Freud’s school of psychoanalysis. The activation of a complex is always marked by the presence of some strong emotion, be it love or hate, joy or anger, or any other. We are all complexed by something, which is to say, we all react emotionally when the right buttons are pushed. Or, to put it another way, an emotional reaction means that a complex has been constellated. 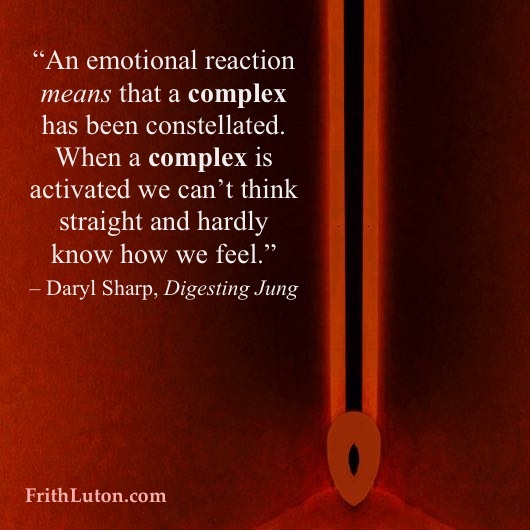 When a complex is activated we can’t think straight and hardly know how we feel. We speak and act according to the dictates of the complex, and when it has run its course we wonder what took over. We cannot get rid of our complexes, simply because they are deeply rooted in our personal history. Complexes are part and parcel of who we are. The most we can do is become aware of how we are influenced by them and how they interfere with our conscious intentions. As long as we are unconscious of our complexes, we are prone to being overwhelmed or driven by them. When we understand them, they lose their power to affect us. They do not disappear, but over time their grip on us can loosen. A psychological complex is a bundle of associations, sometimes painful, sometimes joyful, always accompanied by affect. It has energy and a life of its own. It can upset digestion, breathing and the rate at which the heart beats. It behaves like a partial personality. When we want to say or do something and a complex interferes, we find ourselves saying or doing something quite different from what we intended.